The Scientific and Practical Centre for Sanitary and Epidemiological Expertise and Monitoring, Committee for Public Health Protection, Almaty, the Republic of Kazakhstan. Citation: Aiman N, Adlet K, Gulnaz S, et al. Pollution with Polychlorinated Biphenyls of the Water and the Soil in Almaty. Electronic J Biol, 13:3. According to the Stockholm Protocol, some artificial synthesized organic substances, particularly persistent organic pollutants (POPs), polychlorinated biphenyls (PCBs), when released into the environment, have an extremely negative impact on human beings health. Being chemically and biochemically very stable, they are not destroyed in natural environments and are transmitted through trophic chains to people, suppressing their immunity, provoking the appearance of malignant tumors. There is also mutagenic impact on the health of subsequent generations. At the plenary meeting of the Majilis of the Parliament of the Republic of Kazakhstan, the deputies approved the draft of the law "On ratification of the Stockholm Convention on persistent organic pollutants". Levels of the persistent organic pollutants (POPs) PCBs were measured in 2012 in the Ural River, Republic of Kazakhstan. The authors discovered levels of PCBs significantly above permissible regulatory limits by 3 to 4 times. Since PCBs are extremely toxic substances that can migrate through soil and water and enter the food chain, resulting in human consumption, it is important for the public to be aware of such pollution and for authorities to be apprized so that steps can be taken to protect the public health. This subject is of broad public and scientific interest for regulatory and public health purposes and these results should be widely disseminated as soon as reasonably possible. The subject matter is vitally important from both a local, regional and global perspective. Persistent organic pollutants; Polychlorinated biphenyls; Soil; Water. At the current time, the problem of the ecology of urban areas is becoming increasingly important. Anthropogenic impact on the natural environment, deterioration of its condition and expansion of the territories subjected to urbanization is a characteristic feature of the modern era. The level of environmental risk is significant to megacities due to a huge number of people, vehicles and industry. According to the scientific and technical program "Monitoring of pollution of a large industrial region on the example of Almaty", we assigned the task of the presence or absence of POPs in the form of PCBs and dioxins in natural environments of Almaty. Therefore, we studied 7 districts of Almaty, three of which were industrial areas, and where the majority of the population live in the private sector. There are the following objects in these territories: Combined Heat and Power (CHP-1), LLP "Casting", JSC "Almaty Plant of Heavy Engineering" of Zhetysusky, Turksibsky and Almalinsky districts of Almaty. In these districts, the water from open reservoirs and the soil layer were studied for the content of POPs. The geographic and climatic features of Almaty (location from the south-east to the north-west, above is the mountain ridge of the Zailiysky Alatau) create unfavorable conditions for the dispersion of emissions from industrial enterprises, including motor vehicle exhaust, individual heating sources, the discharge of various sewage into the water in the lower part of the city. Exhaust gases containing carbon oxides, nitrogen, hydrocarbons, solid particles and heavy metal compounds accumulate in the surface layer of the atmosphere. Most of them settle on pavement and soil cover, which exceed the MAC and consequently have a negative impact on humans living here. Pollution of PCBs is included into the list of global, planetary environmental problems and requires immediate solutions, particularly in the territories of large megalopolis. Determination of pollution degree with PCBs of the water and the soil of investigated areas of Almaty. ● Comparison of the obtained research results with the normative levels. Sampling was conducted on schedule during weekdays from May to October by the water and the soil samples in conformity with the "Unified Rules for Sampling of Environments, The health and safety rules and standards 4.01.001.97 RK" . The total number of soil layer samples for PCBs concentrations was 224 and in the open reservoirs, 216. The studies were carried out in the laboratories of "The Scientific and Practical Centre for Sanitary and Epidemiological Expertise and Monitoring", which are accredited by the State Standard of the Republic of Kazakhstan in accordance with the international requirements of GOST ISO/IEC 17025: 2009 "General requirements for the competence of test and calibration laboratories". During the soil and the water researches on the content of POPs, we used 2 instruments: a gas chromatograph by Kristall Lux company and a gas chromatograph mass spectrometer by Agilent (the USA). The determination of dioxin-like POPs was carried out on a gas chromatograph mass spectrometer with a quadripole detector by Agilent designed for highly sensitive analysis of dioxins and POPs . ●MAC in water bodies of domestic drinking and cultural household water use is 0.001 mg/dm3. Sanitary Regulations and Norms No. 4630-88 "Maximum allowable concentration (MAC) and approximate and allowable concentrations (AAC) of harmful substances in water of water bodies of domestic and cultural household water use" . ●AAC for the content of PCBs in soil (summarized) is 0,06 мg/kg. Hygienic standards (HS) No. 2.1.7.2042-06. AAC of chemical substances in soil (Russia) . Due to the pollution of the atmospheric air in Almaty, the issues of its contamination are discussing on the pages of scientific articles by well-known scientists in Kazakhstan , but they have solved the problem of only air. Despite the wide variety of scientific publications devoted to the pollution of Almaty, including the water of rivers and lakes, the soil layer of the earth, there are no POPs pollution problems. The authors are raising issues of heavy metal pollution. Pollution of rivers in Almaty with heavy metals has been significant: in the waters of the rivers there was an important amount of copper and lead (up to 12 MAC); significant concentrations of them were found in the soil of Almaty. The leading place for the contamination with heavy metals is occupied by the soil of the transport intersection, then the airport and the Military Car Base (MCB) branch (Zhetysusky district) . The issues of pollution of water and soil objects with heavy metals also are being raised in the article "Analysis of natural and anthropogenic factors of environmental pollution in Almaty" by Mynbayeva BN, Zh. Makeeva A . In the circulation of POPs in the environment, an important role is played by water of open sources and soil. The soil is the environment where accumulation and migration are possible. Rivers have always been a source of fresh water, but now they have begun to transport waste. The main problem at present is the pollution of fresh water by various pollutants: pesticides, oil and oil products, surfactants. Increasing pollution of water bodies and gutters is observed in all industrial countries, Kazakhstan is no exception [8-11]. Unlike water and atmospheric air, which are only migratory environments, soil is the most objective and stable indicator of anthropogenic pollution. It clearly reflects the emission of pollutants and their actual distribution, which is the case in many scientific papers. The conditions of life, nutrition, economic and industrial activities of a person largely depend on the type and condition of the soil. The content of natural macro and microelements, as well as various exogenous chemicals (ECH) entering the soil as a result of human activity determines different processes. On the one hand, the fertility of the soil and the nutritional value of agricultural plants, and on the other hand, disease emergence of plant, animal and human in the case of absence or excess some microelements or ECH. An evaluation of the results of research of cultural household water in the warm period of the year from May to October was conducted. It included the following rivers: Bolshaya and Malaya Almatinka, Terencara and the Lake Sairan. Totally, 216 samples of surface water from 3 studied districts of Almaty were taken. The analysis of water in Almaty was carried out in the territory of the whole city, however, PCBs were found only in the middle (Almalinsky district) and lower parts of the city (Zhetysusky and Tursibsky districts). Water sampling was conducted by samplers for sampling at three points from both ends and in the middle on the rivers (Esentai, Bolshaya and Malaya Almatinka, Terenkor) and the Lake Sairan. The selection was conducted from May to October, monthly, at 100 sampling points, by taking notice of the river flow. The highest level of PCBs was found in May and June. The level of samples content in the autumn months was significantly lower than in other periods and the levels of PCB detection varied from 2 times up to 17 times. For example, the Esentai River (the highest level of PCB detection was registered: in May at 0.017 ± 0.001 mg/dm3, in June 0.0015 ± 0.0002 mg/dm3, in July and August at 0.0011 ± 0.0002 mg/dm3, in September at 0.0013 ± 0.0002 mg/dm3 and only in October at 0.001 ± 0.0002 mg/dm3, that is, within the limits of regulatory levels (the Russian standards)). A similar situation was observed on the rivers Bolshaya and Malaya Almatinka, Terenkur. In the Lake Sayran the level of PCBs was at 0.0085 ± 0.0003 mg/dm3 during May and June, that is enough high, in July and August at 0.0008 ± 0.00002 mg/dm3 and in September and in October at 0.001 ± 0.0002 mg/dm3. The maximum water concentration levels obtained in the study areas are shown in Figure 1. Figure 1. Detection of polychlorinated biphenyls in the soil and water. Figure 2. Detection of polychlorinated biphenyls in the soil. Totally 123 samples within MAC of 0.001 mg/dm3 and 42 samples with an exceedance of MAC were detected Figure 2. The highest level of sample detection is shown in Figure 3, exceeding MAC from 0.0012 mg/dm3 to 0.017 mgdm3. That exceeds MAC from 1.2 times up to 17 times. Figure 3. Detection of polychlorinated biphenyls in the water. Totally 224 soil samples were taken, 175 samples showed positive results, which was 78.12%. The greatest number of samples was taken in Turksibsky district of Almaty, 122 of 224 samples, PCBs were found in 95 samples, of which 15 were at the level of the AAC of 0.06 mg/kg (Russian Federation standards). In 5 samples PCBs level was from 0.277 up to 0.56 mg/kg, which exceeded MAC from 4.61 times to 9.33 times. In Almalinsky district, 44 samples were taken, of which PCBs were found in 25 and in 4 samples PCB concentrations were from 0.248 up to 0.704 mg/kg, which exceeded MAC from 4.13 times to 11.73 times. In Zhetysusky district, 58 samples were taken, of which PCBs were found in 55 samples, of which 15 were at the level of MAC of 0.06 ± 0.005 mg/kg. In 4 samples, the level of PCBs exceeded from 0.133 up to 0.51 mg/kg, which exceeds the regulatory level from 2.21 times to 8.5 times. The most significant pollution was observed in the industrial zone on the Auezov and Gogol streets, 0.704 mg/kg, which exceeds the regulatory level by 11.73 times, in the territories of gas stations along the streets of Bukhtarminskaya 2.0.56 mg/kg, Zhansugurov 176, 0.51 mg/kg, Tole bi 218, 0.565 mg/kg. 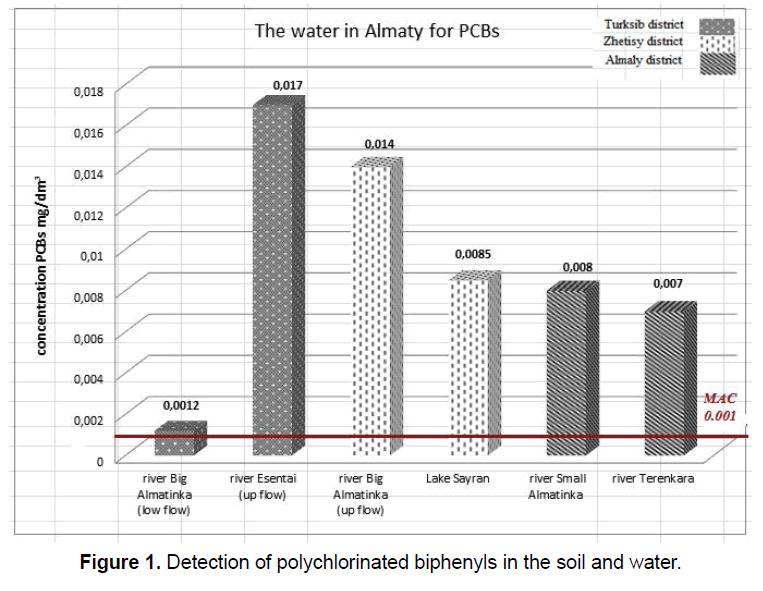 Thus, contamination of the soil layer by PCBs in all three districts of the areas studied in Almaty has a high level of detection of PCBs (from 0.06 ± 0.005 mg/kg up to 0.704 ± 0.03 mg/kg). The availability of the water resources is extremely important for the existence of man and nature. The water performs irreplaceable functions in the biosphere as a habitat for the plant and animal life and the most important element of the cycle of substances. Traditionally, rivers are connected with lakes, other water sources and the development of all types of social production . Water is the main natural component that provides human life but at the present the level of water pollution in rivers and lakes has a very high content of the maximum allowable concentration (MAC) in Almaty . Unlike water and atmospheric air, which are only migratory environments, soil is the most objective and stable indicator of man-made pollution. It clearly reflects the emission of pollutants and their actual distribution in the components of urban areas. For the investigation of soil pollution in Almaty there were selected samples from the zones closely located to the industrial enterprises and the surrounding areas to the gas station with the highest possible oil pollution of vehicles with oil products. The main sources of regional contamination of the soil with carcinogenic substances are the exhausts of motor vehicles, industrial emissions and refined products. The export of industrial and domestic waste to junk yards leads to pollution and irrational use of land creates real threats of significant pollution of the atmosphere, surface and groundwater, an increase in transport costs and a non-returnable loss of valuable materials and substances. For the research of the soil contamination in Almaty city, the samples were taken from the main zones and adjacent territories to gasoline stations, where the greatest pollution of the motor vehicle with oil products and toxic metals is possible. 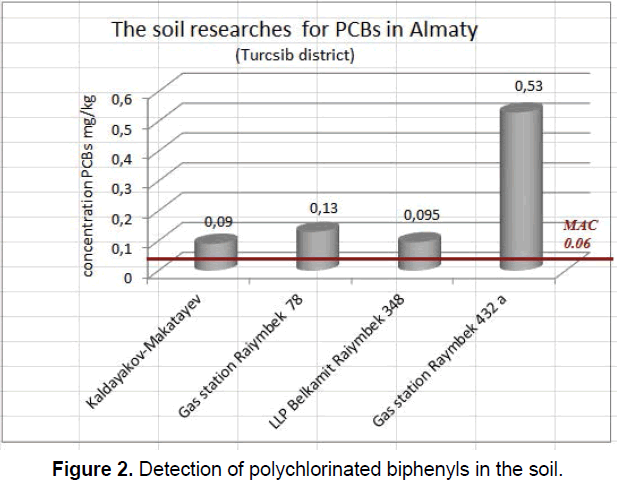 The presence of PCBs in the soil of seven studied areas was indicated in all these areas in Almaty . As it is known, the water creates a hydrological regime of life on the earth. In contrast to the air, which are the only migration environments, soil and water is the most objective and stable indicator of the technogenic pollution. They clearly reflect the emission of pollutants and their actual distribution. Therefore, the establishment of pollution of soil and ground water with high concentration of polychlorinated biphenyls indicates carcinogen’s factor, which is a risk factor for the citizens of the studied areas of Almaty . Conducted research results allow us to evaluate the studied regions in Almaty as unfavorable in relation to chemical and toxicological indicators and respectively show the general trend of contamination of large industrial cities with chemical contaminants that cause serious diseases of the 21st century as allergic diseases, skin dermatitis, endocrine disorders and cancer [16-18]. The results of studies made it possible to identify the main environmental pollutants are chemical contaminants in the form of persistent organic pollutants, which are PCBs not only in industrial cities, but also in large megapolises, where the level of industry is very low, this is the city of Almaty . Therefore, a high level of detection of PCBs indicates an unfavorable ecological situation that can be the cause of the growth and disease of the population of Almaty, characteristic of POPs - skin and subcutaneous tissue diseases, endocrine system in the form of diabetes among children and adolescents, as well as eye diseases in the form of glaucoma. Out of 17 regions of Kazakhstan, all these diseases rank first in Almaty (Table 1). Table 1. Morbidity of adult and children of Almaty for 100 000 thousand of population. Thus, the high level of PCBs in water and soil has a negative impact on the population of Almaty, especially women and children. As the statistical incidence reports for 2014 and 2015 indicate, the level in Almaty for such pathologies as eye diseases and its adnexa, including glaucoma, skin and subcutaneous tissue diseases, endocrine system diseases have an increase and significantly exceed republican rates [17,18]. These diseases, as indicated in the domestic and foreign literature are characteristic for the pathology of POPs, including PCBs [19-21]. The components of high temperature carriers, dielectrics, flame retardants, lacquer fillers, paints, containing PCBs are the cause of high water pollution of surface water bodies and soil layers of the earth during a wide application in various industries as plasticizers, lubricants. This trend can be observed near industrial enterprises of our city as the Combined Heat and Power (CHP-1), LLP "Casting", JSC "Almaty Plant of heavy Engineering". Unified Rules for Sampling of Environments. The health and safety rules and standards 4.01.001.97 RK. 5-8. Furst P, Bernsmann T, Baumeister D. (2013). Determination of polychlorinated dibenzo-p-dioxinc (PCDD) and polychlorinated dibenzofurans (PCDF) in foodstuffs and animal feed using the Agilent 7000 Triple Quadrupole GC/MS system: Chemical and Veterinary Analytical Institute. Germany. Agilent Technologies. 1-14. Sanitary Regulations and Norms number 4630-88. Maximum allowable concentration and approximate, Russia. 23-27. Hygienic standards (HS) 2.1.7.2042-06. AAC of chemical substances in soil, Russia. 15-16. Kenesaryev UI, Dosmukhamedov AT, Alimova NE, et al. (2014). Levels of atmospheric air pollution of Almaty city by priority substances. Bulletin of Kazakh National Medical University. 3: 52-54. Bochkov AS, Zubkov VM. (2015). Regulation of the content of chemicals in soils and the impact of pollution on public health: VII International Student Electronic Scientific Conference. Student Scientific Forum 2015, Moscow. Mynbayeva BN, Makeyev AZ. (2011). Assessment of soil pollution in Almaty by heavy metals using chemical and mathematical methods. Fundamental Research. 10: 131-136. Centre for Humanitarian Technologies. (2014). Report of the world economic forum. Global Risks Report 2014. Centre for Humanitarian Technologies, Moscow. Montuori P, Aurino S, Garzonio F, et al. (2016). Polychlorinated biphenyls and organochlorine pesticides in Tiber River and Estuary: Occurrence, distribution and ecological risk. Sci Total Environ. 571: 1001-1016. Baeva YI, Chernykh NA. (2016). Evaluation of migration ability of polychlorinated biphenyls in the "soil-plant" and "soil-earthworms". Gig Sanit. 95: 336-339. Vrijheid M, Casas M, Gascon M, et al. (2016). Environmental pollutants and child health-A review of recent concerns. Int J Hyg Environ Health. 219: 331-342. Revich B. (2013). Problems of the influence of persistent organic pollutants on the health of urban population. Hygiene and Sanitation. 20: 12-13. Nurkeev S, Kazova R, Tursbekov B, et al. (2013). The ecological status of Almaty city. Kazakh National Technical University. 10: 110-111. Goncharov N, Ahmetkaliyev M, Zhakashev N. (2000). The impact of industrial emissions of certain chemical industries of Kazakhstan for soil pollution. Environmental Hygiene Issues. 12: 9. Sultanova R, Konkulzhaeva N, Anisimova N. (2013). Pollution of the environment in Almaty and their impact on public health, IX International Scientific and Practical Conference "Scientific community of students of the XXI century. Natural sciences. 4: 12-114. Alimov A, Samusevich I. (2014). Environmental problems of big cities and industrial zones. Society. Environment Development. 7: 236. The Ministry of Health of the Republic of Kazakhstan. (2016). Statistical collection. Health of the population of the Republic of Kazakhstan and activities of health care organizations in 2015. Kurlandsky BA. (2011). Features of revealing the causes of environmentally caused diseases among children. Hygiene and Sanitation. 5: 45. Zasorina BV. (2009). An assessment of the carcinogenic risk to the health of the population of urbanized areas under the influence of environmental factors. University Dissertation. 8-11. Maistrenko VN, Kruglov EA, Amirova ZK, et al. (1998). Polychlorinated dioxins and dibenzofurans in the environment and food products of the Republic of Bashkortostan, Russia. Chemosphere. 3: 102-113.